I have one particular VM that is spanning beyond the 1TB limit for a VMDK. Anyone know of a solution as to how to get it to recognize or create drives larger than 1TB? I have a pool of space to use on our datastore in a raid array so I create virtual drives. I'd prefer not to have to purchase an external drive and directly plug it into my server because the acronis appliance itself uses vmotion and high availability so it does move around between physical hosts depending on the resource load. Also like to preface I do not use cifs nor ftp. It needs to be NFS (actually a direct nfs link would be a great addition in the future updates) to a datastore. can you please specify which versions you are using? Windows hosted VMP9 supports larger drives as Windows supports them. Have a VMP9 management server running on Windows 2008 R2 and using a 2TB VMDK for backups. 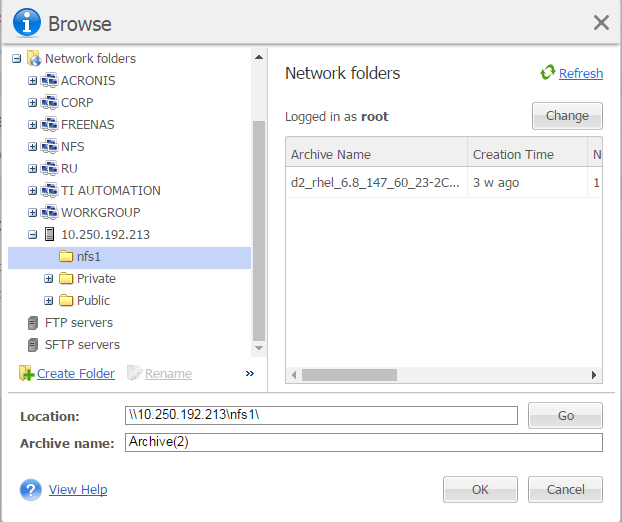 There is also one tip which might be of use to you: the NFS protocol is already supported by Acronis Backup for VMware 9 in Virtual Appliance in the currently available public builds. If your network share is available over NFS then you can address it using the same syntax as for CIFS share: \\server\share\ . Appliance will try mounting the share via both NFS and CIFS - whichever succeeds first. See attached screen shot with the sample. Thanks I didn't know NFS was usable in this way. That may solve my problem. I'll let you know if I can get it going. Backups not quite working but I suspect its a permission issue on my end. I was able to mount the drive though. This is a good solution. However in future releases it would be beneficial if we could specify backup locations somewhere in the web UI. Meaning a location we can mount all the backup locations we want to use. So we can edit / add / remove them from a single location instead of inside of each backup job. It also doesn't save credentials for NFS mounts. So every time if I reboot the server or create a new job I'd need to validate the connection again. Actually you can do this already from View->Recovery Points. Once you add a backup location there, it will become available for selection under "Recent locations" item in the left in the Browse pop-up dialogue (when configuring backup destination in the backup task). The credentials for the network shares are cached for "Recent locations" mentioned above during the current web console session - you can provide the creds once and then when creating new backup tasks select the backup location under "Recent locations" - it won't prompt you for login/password. Still you will have to input creds at least once after appliance reboot or after web console restart (depending on browser). Thanks for the update. That would be my next request then to have a checkbox to either save credentials or allow for in some circumstances where a network is isolated there is no user necessary for NFS.